Written on January 24, 2017 . Posted in Architecture and Design. 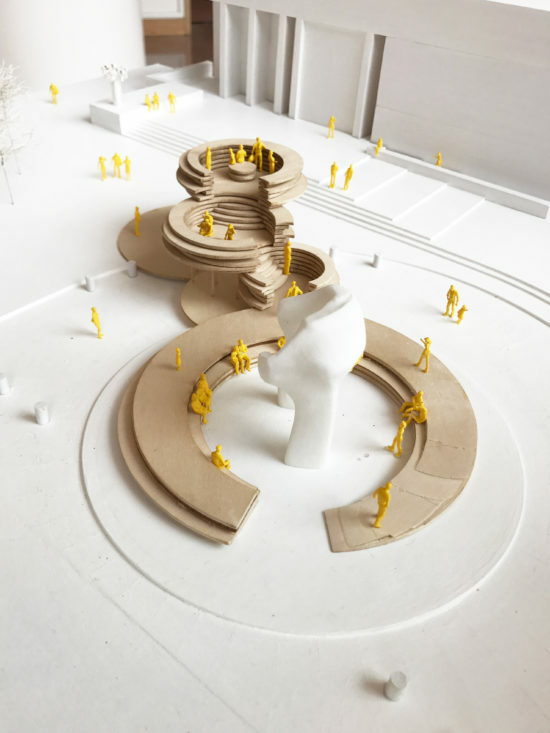 Yugon Kim (Critic, Interior Architecture) has won the Miller Prize Commission for the Cleo Rogers Memorial Library plaza in Columbus, Indiana. 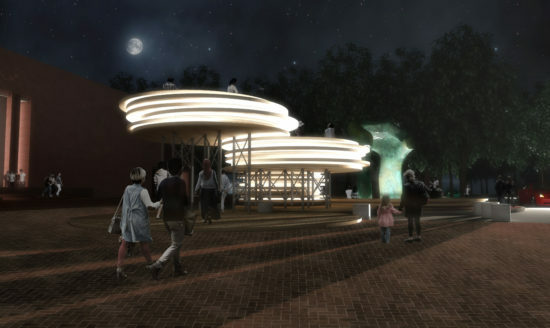 His design entitled Conversation Plinth, pays homage to J. Irwin Miller and aims to celebrate the community of Columbus. Its form takes cues from the conversation pit in the living room of the Miller House, as well as the plinths that elevate the important landmarks immediately surrounding the site, namely, the library designed by I. M. Pei, the First Christian Church designed by Saarinen church, and the Large Arch by Henry Moore. The installation offers a place for the community to gather and converse, and elevates people, both literally and metaphorically. 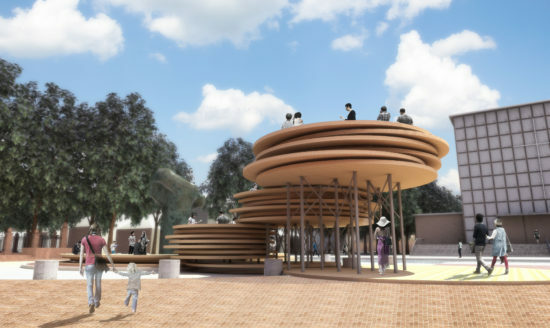 Starting around the perimeter of the Moore sculpture on the eastern half of the site, large shifting timber discs compose a series of plinths that rise upward towards the west. By bridging across the now defunct rotary and occupying what is now an empty area of the plaza, the installation seeks to restore programmatic function to the site, encourage dynamic circulation around the sculpture, and allow the plaza to be experienced in a new way in both horizontal and vertical directions. The installation will be made of a hi-tech engineered timber product called Cross Laminated Timber (CLT). Although, softwood CLT already exists in the United States, hardwood CLT does not. The proposal aims to jumpstart and then accelerate the development and use of hardwood CLT fabricated from parts of logs harvested from Indiana forests that can currently only be used to produce low value wood products. It seeks to demonstrate the viability and the benefits of a new high value timber market in Indiana. This pioneering use of hardwood CLT will be a partnership between national and state based companies, combined with the expertise in testing of several local academic institutions, and the support and encouragement of the U. S. Forest Service. This is an ambitious project that aims not only to honor the vibrant community of Columbus, but also to place the city on the forefront of new material research and ultimately to contribute significantly to the timber industry of Indiana by developing and substantiating the use of hardwood CLT.